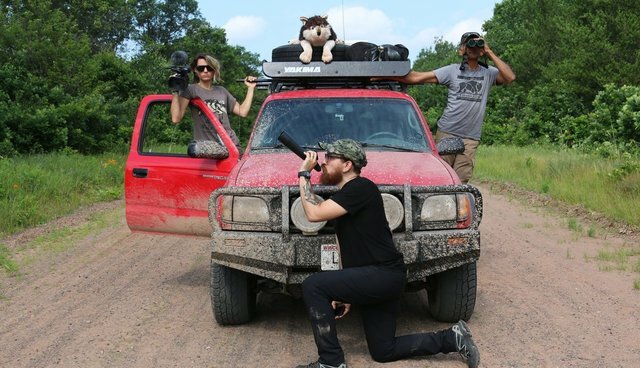 Beginning September 9, 2015, Wolf Patrol will return to the northwoods of Wisconsin alongside hunters to document the outdated hunting practice of bear baiting and hunting bears with hounds. This will launch the fall campaign of Wolf Patrol, a citizen-activist monitoring project, to end bear baiting in the Chequamegon-Nicolet National Forest. Crew members of Wolf Patrol from Wisconsin and Michigan will be available for comment during the hound hunt for bear on public lands until late September 2015. Documentation of the hound hunt for bear in Wisconsin will be posted daily on Wolf Patrol's YouTube channel. The number one human/wolf conflict in Wisconsin is the killing of bear hunting hounds by wolves defending their families and feeding areas. In Wisconsin, it is legal to artificially feed bears beginning in mid-April, and by the beginning of bear season in September, bears, wolves, deer and other animals have become conditioned to feed from bear baits. Bear baits are artificial feed stations where hunters are allowed to dump fryer grease, sugary baked goods, and food scraps in large piles so black bears feed there and can later more easily be shot. Hound hunters are allowed to chase bears beginning July 1st, which is when many wolf packs are traveling with pups. Since July, nine bear hounds have been killed in northern Wisconsin according to the Department of Natural Resources (DNR). Activists will be patrolling known bear baiting areas on public lands beginning in the predawn hours of opening days of the hunt, in an effort to document the practice of bear baiting and hound hunting as part of their campaign to end bear baiting and hound hunting in the Chequamegon-Nicolet National Forest. "We aren't here to break any laws, we just believe that in Wisconsin, like every other national forest, you shouldn't be allowed to feed the bears." says founder of Wolf Patrol, Rod Coronado. There is no limit to the number of bear baits a hunter can maintain in Wisconsin. "Many of these bear baits on public lands are virtual oil spills where its legal to dump up to ten gallons of fryer grease." says Coronado, "Baiting bears and running them down with GPS-equipped dogs through wolf territory isn't hunting, it's unethical, unsporting and should be illegal." Delaying the start of bear-baiting season until September 1st, so gray wolves do not habituate to or defend bear-bait sites, causing unneeded conflict with hounds used by bear hunters. Banning bear-baiting, the intentional feeding of bears and other wildlife to lure them into one location, in the Chequamegon-Nicolet National Forest. Banning hound-hunting, the use of domestic dogs to hunt bears, wolves, coyotes and fox, in which hounds are used to find, chase, harass and kill wildlife on Wisconsin's public lands. When Wolf Patrol was in the field in July documenting bear baiting sites in Wisconsin, three of our patrol members were informed by a Polk County Deputy Sheriff that they would be cited for hunter harassment, due to a complaint from a hunter who was had issues with our presence in the field. The Deputy Sheriff did not have the statute number at the time, so told our patrol members to go to the courthouse the following day. There was no citation at the courthouse the next day, and no citations have been issued since. We believe no citations have been issued in this case because of the lack of evidence that our patrol members were doing anything illegal. We will continue to adhere to relevant laws during our patrols, as we have since Wolf Patrol's inception. In 2013, Wolf Patrol launched their multi-state citizen-activist campaign to protect endangered gray wolves on public lands who were being delisted and subject to management by hunting under a variety of jurisdictions and rules even before these new populations were fully understood. The 2014 Wolf Patrol campaign focused on documenting illegally set wolf traps the state-sanctioned wolf hunt in December that authorized the use of hounds to hunt wolves in northern Wisconsin. With gray wolves returned to protection under the Endangered Species Act in the upper Midwest December 2014, Wolf Patrol continues to investigate threats to the continued recovery of gray wolves in the Great Lakes ecosystem.